Automobile domestic sales growth in July 2015 slowed down a little to 1.39% after growing 2.56% in June 2015 according to the Society of Indian Automobile Manufacturers (SIAM) released figures. Despite a solid growth in Passenger vehicles and Medium & heavy Commercial vehicles, motorcycles and light commercial vehicles pulled down the industry growth. 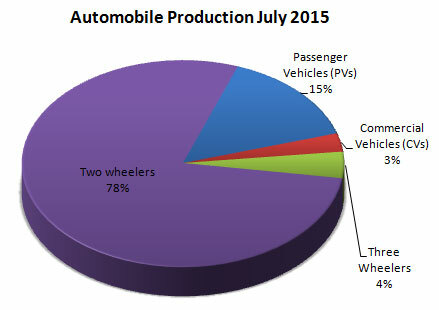 Growth in automobiles industry production and exports also came down at 2.48% and 6.94%, respectively. 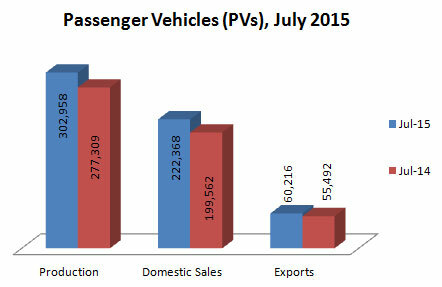 Sales in passenger vehicles segment had a growth of 11.43% in July 2015 compared to the same period in 2014. This growth was mainly boosted by the passenger car sales which grew by 17.47%. 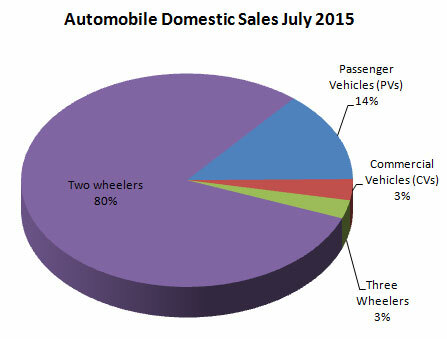 Bringing down the momentum utility vehicles sales grew a marginal 0.37% while sales in vans declined by 8.8%. 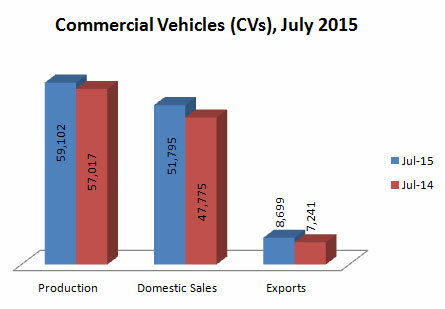 Commercial Vehicles, which had a growth of 8.41% in July 2015, had the same mix trends. Medium & Heavy Commercial Vehicles (M&HCVs) posted growth with sales rising by 29.49%, with passenger carriers growing 50.51% and goods carriers growing 25.32%. Sales in Light Commercial Vehicles (LCVs) segment declined by 4.11%, because of 6.31% decline in goods carriers while the passenger carriers grew by 8.99%. Three wheelers segment registered largest fall with sales declining by 12.26%. Both passenger carriers and goods carriers declined by 12.16% and 12.81% respectively. 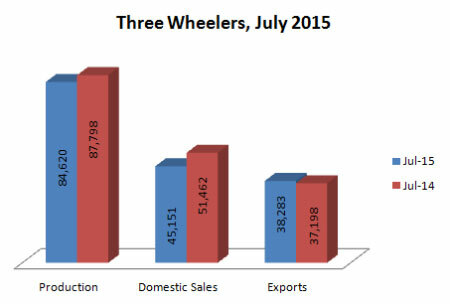 Two Wheelers segment could manage just a 0.14% growth in July 2015 with the push coming from Scooters sales growth of 15.36%. Motorcycles sales declined by 6.36% while mopeds declined by 1.52% in July 2015. Exports remained positive across all segments, registering growth of 6.94% in July 2015 over July 2014. 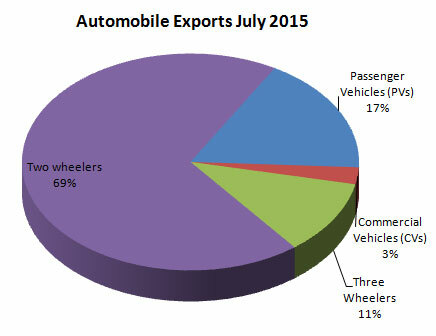 Exports of passenger vehicles were up by 8.51% in July 2015. Commercial vehicles had a 20.14% growth in exports while three wheelers and two wheelers also registered growth of 2.92% and 6.80% respectively in exports.